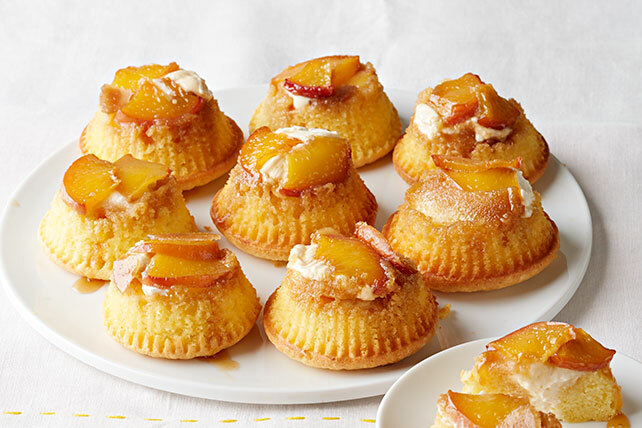 Enjoy these Peaches and Cream Mini Upside-Down Cakes as a special dessert! Watch now to learn why we love these sweet and gooey mini cakes. Bake 18 to 20 min. or until toothpick inserted in centers comes out clean. Cool 10 min. Transfer cupcakes to wire racks; cool completely. Beat remaining pudding mix and milk in medium bowl with whisk 2 min. Stir in COOL WHIP. Spoon into pastry bag fitted with large plain tip. Insert tip into centers of cupcakes, then pipe pudding mixture into cupcakes. Refrigerate until ready to serve. Invert cupcakes onto plates just before serving; remove liners. Substitute 2/3 cup dry yellow cake mix (from a 2-layer cake mix package) for the 9-oz. pkg. of cake mix. These fun cupcakes can be refrigerated up to 24 hours before serving.